One of the most famous and popular dishes in Sicily, particularly near the city of Catania, is Pasta alla Norma. As with most of Italian dishes, Pasta alla Norna starts with a legend. This dish dates back to the early 1800s and is named after the famous Sicilian opera composer Vincenzo Bellini’s wildly successful opera, Norma. The essential ingredients such as fried eggplants (preferably Sicilian), tomato sauce (made with fresh basil) and ricotta salata must be used. Our recipe uses these traditional ingredients and particular methods such as pre-frying the eggplant in olive oil to make the best possible tribute outside of Catania. 2-3 fresh ripe plum tomatoes, skinned and chopped. 1. Prep the eggplant, cut, salt (prep the other ingredients) and rinse, set aside. 2. In a skillet, sauté the eggplant in olive oil and set aside. 2. Optional: In the medium sized dutch oven or sauce pan, fry the cubed pancetta until crispy using 2 tbsp of olive oil. medium heat. 3. In a dutch oven or medium/large sauce pot sauté the onions, garlic and the (optional) Peperoncino in olive oil. 4. When the onions are translucent and the garlic begins to brown slightly add the cup of white wine. let come to a simmer and add 2-3 bay leaves. Cook for 3-5 minutes. 5. Add the fresh chopped plum tomatoes (or the hand-crushed canned tomatoes) and cook for about 5-10 minutes or until the tomatoes break down. 6. Once the sauce returns to a simmer, add 1 cup of water and bring it back up to a slow boil. As it simmers taste and season with an appropriate amount of salt and pepper. 7. Once the sauce has been simmering for about 10 minutes, add the basil and lemon juice. 8. As the sauce simmers, fold in the cooked eggplant, mix well and let cook for 5-10 minutes allowing the flavors to blend together. 9. Add Pecorino Romano cheese and a ladle of ‘pasta water.’ let cook for 5-10 minutes. 10. 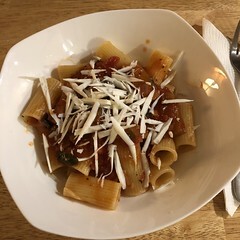 Top pasta with ricotta salata. A Blood Orange and Fennel Salad with olive oil and white balsamic dressing is the perfect compliment.